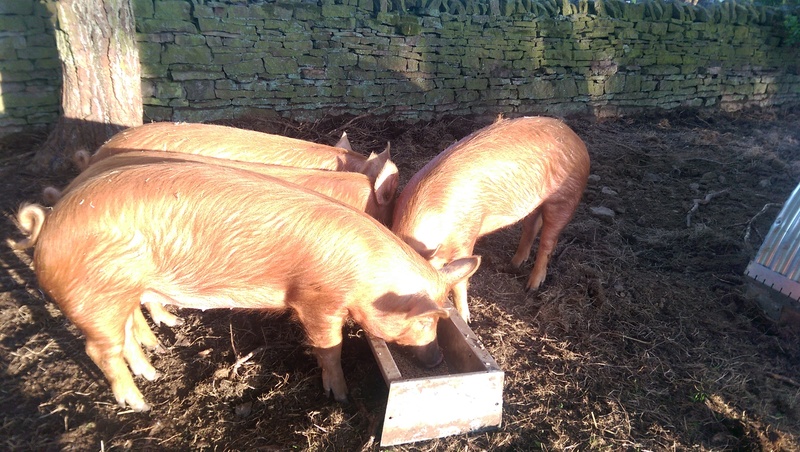 Earlier this week the 4 Tamworths turned 6 months old so I started to think about a special pig blog update. This batch of pigs has not featured heavily in the blog so it would be good to rectify that a little. It’s definitely time for a weigh-in as the 2 “eaters” will be heading off to the butchers later in the summer and I’ll need to plan ahead for that. 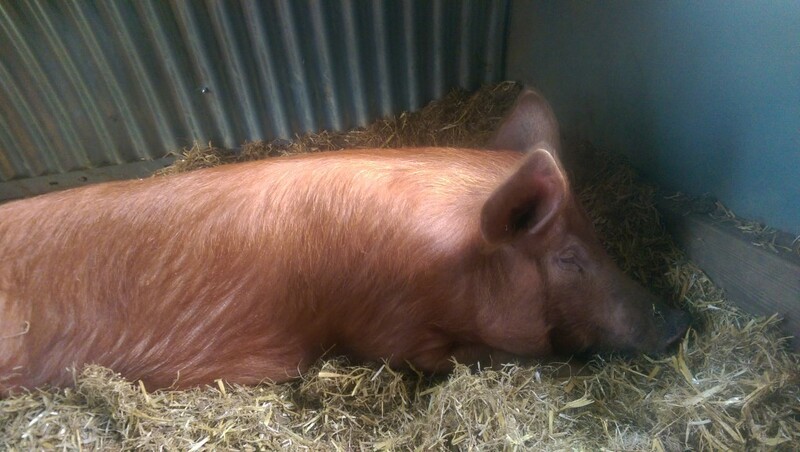 The 2 “keepers” need to be monitored as well though so that they are in good condition when we want to get them in-pig towards the end of Autumn. Last night one of the “keepers” suddenly showed signs of being ill with reduced appetite – she ate but left the feed trough before finishing – and uncharacteristically lethargic when compared to the 3 others – ambling instead of running. The other 3 were oblivious to all of this and they happily cleared any extra left overs from the feed trough without batting an eye. Fortunately she ambled over to me and was quite happy to lie down for a scratch which meant I could have a closer examination. To my untrained eye there was nothing obvious and no flinching when I checked everything I could think of at both ends as well as the feet and legs. It’s only at times like this that you realise how lucky we’ve been with no major health incidents for any of the 3 batches of pigs we’ve had. Of course, they were all weaners in the past and only kept for 4-5 months so if looked after correctly there’s not much that can go wrong. Now that we’ve decided to keep some for breeding we’ll have them for years to come and will need to be much more aware of the potential problems. It’s always best to keep alert to any signs of illness and if possible prevent anything rather than treating it. As luck would have it, this morning she appeared to be on the mend with an improved appetite and a little more spring in her step. Not fully back to normal but a definite improvement from last night which is good. Once they are all busy at the trough, the task of measuring is made much simpler although you do have to take into account the fact that their heads generally stay down in the food which can affect the length measurement. As these were all tattooed by the breeder we can easily identify them by the last digit from the ear and that saves us from the temptation of giving them names. On reading back through old posts here for the previous set of weaners I find that we sent the 3 Oxford Sandy and Black boys off at about this weight last year. On reflection that was too early but they had got a little more boisterous and hadn’t had the snip either so we were nervous about keeping them for too long. Luckily this years Tamworths are all females and I’ve decided to grow the “eaters” on to 90kg or perhaps even a little over that. This should mean that we get some good-sized cuts to turn into bacon plus the roasting joints might be a little larger.